Canada’s Erynn Ballard took home the Martha Jolicoeur Leading Lady Rider title on Saturday, February 9, during the fifth week of competition at the 12-week Winter Equestrian Festival (WEF) in Wellington, FL. Ballard and her mount Darko’s Promise, an 11-year-old Irish Sport Horse gelding owned by Ilan Ferder, had a banner week. The pair guaranteed themselves an appearance during “Saturday Night Lights” by winning Thursday’s qualifier, the $134,000 CSI5* Equinimity WEF Challenge Cup Round 5. They then earned a top-15 finish in the $391,000 CSI5* Fidelity Investments® Grand Prix amongst some of the greatest horses and riders in the world. 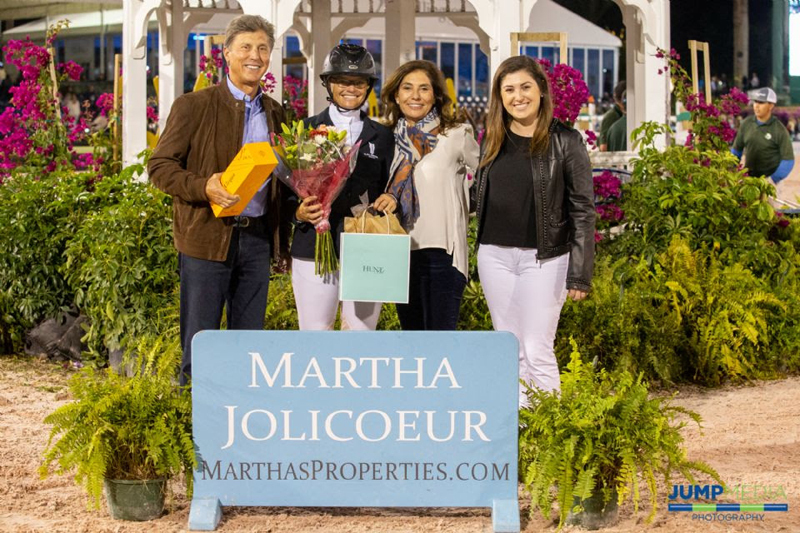 In recognition of her Leading Lady title, Ballard was presented with a bottle of champagne, bouquet of flowers, and gift certificate for a shopping spree at Hunt, Ltd.
During the 12th and final week of WEF, the Martha Jolicoeur Overall Leading Lady Rider Award will be presented to the female rider who accumulates the most points throughout the Winter Equestrian Festival. So far this season, Tiffany Foster, Lauren Hough, Beezie Madden, and Margie Engle have earned the weekly honor and have set their sights on earning the overall title.